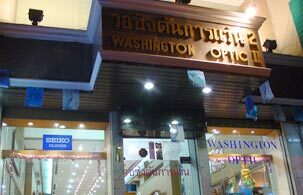 We invite you to visit to our showroom “Washington Optic” on Rasada Rd. and try on one of our fashionable frames for yourself. We guarantee that the fit of the frames is comfortable and pleasing to the wearer. Our showroom also provides sale & repair for genuine both Swiss and Japanese watch brands. You can contact us every time if you have any questions concerning our eyewear or watch and we will be pleased to assist you.